This novel was published in 1982, and it is the direct follow up in Mr.Ludlum's career to his legendary Bourne Identity novel. In future years, Mr.Ludlum would seemingly forget how to write character depth, but at the time of this novel he remembered to include depth for most of the stories characters. Some of the sequences are "cookie cutter" for this author, the first 200 pages of this book seemed so similar to the first 200 pages of Bourne Identity that I was debating if I was wasting my time, and later in the novel there is an unraveling mystery location which won't be unfamiliar in the least to those who have already read "Bourne Ultimatum" this location just happens to be on a different continent. The conspiracy in this story is a bit "over-complicated" here is the summary of what it is about. Michael Havlock is a recently retired US covert agent, who decided to throw in the towel when he realized that his girlfriend was a double agent feeding information to the Soviets. He made arrangements for her assassination, but after it occurs on a spanish beach called "Costa Brava" he feels bad about it and deciders to retire. Except there is a problem... the assassination was a staged act, and his girlfriend was not actually killed. Why would this happen....? That's where things get overly complicated, what it later boils down to is that there are two Soviet moles working deep inside the US State department. One goes by the code name "Parsifal" and the other "Ambiguity:" The protagonist Havlock had once had an ally in the US Secretary of State Anton Matthias, but now he can't seem to get Matthias on the phone? Why would that be?Answer- Parsifal and Ambiguity have brainwashed the secretary of state to do their bidding, and they have gotten him to sign two aggression pacts with Russia and with China, each pact saying that they would team up with one to nuke the other if one of the two signing parties felt it was time to launch. And here is where things start to get a bit grey for me... Maybe I'm just a product of my time, I was born the year this book was published. I am meant to understand that US-Russian relations "cooled down" in 1986 and finally hit a brave new world as the USSR collapsed in 1991 as a 9 year old sat pissed in front of the tv cause President HW Bush was on every station but that Urkle kid was nowhere to be found. (Anyway....) If your around my age, you probably spent more time worrying that rogue nations like North Korea or terrorist groups would use Russian designed Nuclear weapons against us then you worried that the Russian Federation President would consciously launch a nuclear attack against the west. Although everybody knows China has many Nukes pointed at the US, and we do the same to them, you probably don't worry about this very much because inspite of any ideological differences we have with our biggest trading partner, they are just that, are greatest trading partner. We wouldn't be very happy campers if we didn't have their cheap merchandise to use, and they wouldn't be happy if they didn't have our money for these products initially, and then our money all over again as we pay inerest on debt money that we owe them. Point end point, I don't worry about the Chinese launching nukes against us, you shouldn't either. They are the greatest capitalist nation in the modern world, and they know that destroying us would be very bad for business. But getting back to the subject matter of this novel... maybe things were different in 1982... Ludlum suggests the communist nations would launch upon reading the signature of the US secretary of state that he has secretly agreed to a launch pact. I just don't buy this, not today and probably not in 1982 either. I imagine that if one of the communist leaders was presented with such a document. Things would probably go something like this- Chinese Premier- Hmm, this document is very very strange, I call Moscow and Washington, we see what's going on. Russian Premier- Ah- Chairman Mao... Priveyet! i hear you call me about US document of Nuke pact. I have thee President Reagan on uh how you say... conference call let us see what's going on. President Reagan- Chairman Mao, President Gorbachev, this is the Gipper here, and I understand you both feel very upset about this document you read that was signed by my former secretary of state General Doofachuck. Let me assure you, that he had no authority from me to sign any such document and I in no way encouraged him to do so. From what my advisers have told me he was coerced into signing by forces beyond his control and has since been placed in a mental institution. I hope you understand this has just been a big goof, these kinds of things happen and I hearby invalidate this document. Russian Premier- I accept this apology by the US president and resign myself to vodka drinking. Dad Vidanya's commerades! Chinese Premier- I accept too! But when we gonna play ping pong? I best player in all the world! President Regan- Not today Mao, maybe my doctor will clear me next year, I am recovering from a gunshot wound ya know. Chinese Premier- As yes, me so sorry! You feel well soon! Good bye! So you see from this crude analogy, the terror factor just wasn't there for me in this novel, because the likely reaction Ludlum asks us to fear for just doesn't seem feasible. 2 stars for not being the worst Ludlum story I ever read, But by no means as logical as Bourne Identity either. After the disasters of 'Holcroft Covenant' and 'Chancellor Manuscript' Ludlum is back to somewhere near his best. This book is good because Ludlum sticks to what he does best - spies and their strategic games; leaving aside tedious politics and economics. The story is essentially just strategies, traps, moves & countermoves devised, executed and subsequently taken apart by the best of the spies in the Consular Operations and the VKR (a right-wing part of the KGB).Micheal Havelock, our hero and the best secret agent of the Cons Ops, saw his love, Jenna Karas, die on a beach in Barcelona following what he thought was a betrayal. The shock is enough for him to exit the game. Then a chance glance at a crowded Rome train station changes everything. He realizes that she is, in fact, NOT dead. What follows is a really convoluted plot starting with Russian, French, Corsican & African agents and going all the way to the most powerful man on earth, the President of the United States. Throw in a Russian mole at the highest reaches of the State Department and the very real possibility of nuclear war involving the US, Russia & China, and we have an absolute humdinger of a book!Ludlum writes as ever with an economy that makes his action seem very real. The pace is just nice, and the twists don't stop right to the end. A great read! Dec 2014 Reread.STill love this a million times over. Admittedly there are things I skim when I'm reading something for the 20th (or more) time. But I love these characters, I love the clever espionage, and the mystery here is completely unique. OLD: My very very very very favorite Ludlum book. I read these over and over again in high school and college, raiding my parents' library. I eventually had to start buying my own copies. This is definitely my favorite. Third time was the charm for plodding through this conspiracy thriller. Cold War spy Michael Havelock wants out after killing his KGB double agent girlfriend Jenna. After a few weeks' retirement, where he is approached by spooks on both sides (making me wonder how great of a spy he could have been, if everyone knew him by sight), he catches a glimpse of Jenna in a train station. What follows is a chase from Europe to the US to find his true love. The questions begin to stack up: Who wanted Michael out? Why wasn't he killed? Who is Parsifal and why is he into Mosaics? Following the answers, Michael uncovers a plot by a madman to bring the world to nuclear Armageddon (this is the Cold War after all, everything was always about nukes). Unfortunately, it's not as exciting as it sounds. Yeah, the plot has just the right amount of action and melodrama, but the telling is very talky. And to be honest, I'm still not sure why Michael wasn't killed, why Jenna's death was faked, or how they saved the world in 1982 from insane Kissinger. Well i am glad I finally got this book read. It has taken me 4 or 5 times to sit down and read the entire thing. Well what did I think.......In one word....CONVOLUTED! This book is so confusing. Really, when you get to the end and you have some idea what the story is about, you seem to think gee I could have made it much more coherent for the reader. The plot is so simple, and in my opinion a little weak. There is just so many words, and subplots and verbal beatings around the bush. I just felt like shouting "Get to the point Ludlum!" (note the exclamation point...its a favorite of Ludlums). I felt the first half of the book is way better than the second half. At first its a pretty decent novel, but after hundreds of pages it just gets old. This book could have been 300 to 400 pages instead of almost 700. why do I give it 3 stars? Well i guess I feel generous today, and in my own demented way I kind of like Ludlum. I should only give it 2 stars. The second Ludlum book I read. After consulting several top 10 ludlum lists, this book figured in the top 5 in all of them. My main gripe with this book is that it is too similar to the Janus Directive, the previous Ludlum book I read. Though it easily trumps the Cry of the Halidon, the next book I am reading. As a thriller, it does not disappoint. Twists and turns abound. The central conflict of the book, of a hero who is led to believe his love has betrayed him and his country, is interesting enough to keep the reader invested. There is a plot point regarding the hero’s mentor which I found meh. Just didn’t do it for me. The last 250 pages ratchets the tension high enough and it kept me engrossed and I finished those 250 in a day. Overall, a good book. I loved this when I was a teenager and I still do. Ludlum's plot questions the power behind those in power and he creates a cast of characters that weave about so much it left me wondering who would end up being the good or the bad guys. It's an intense read - so if you like fast-paced and fabulous, I'd highly recommend this. I think this was one of my top 2 favorite Robert Ludlum books. He is an awesome writer! Keeps me reading till my eyes are red and the sun is coming up! Started slow for me, but the intrigue keeps you guessing until the final chapter. Cross and double cross, moles and enemies and friends are all called into question. A good cold war story. I just wish Ludlum didn't use so much description at times, as it holds up the story. The story was interesting but there were so many unnecessary details that the book seemed to drag on too long. phew... So it took me almost 11 days to finish this book not because I'm a slow reader but but ... there are a lot of buts. Mr. Ludlum fed me too many characters and led me to too many events before the build-up to his plot most of which caused me to put the book down on several occasions. I don't know about others but it seemed to me that he unnecessarily lengthened the buildup. I won't say the story was bad but why feeding readers too many unnecessary pages,why making things so convoluted. I liked what he tried to say through this book but not the way he said it. I would've really appreciated if he were more concise. High expectations ended in disappointment. I don't know when is the next time I'm gonna pick up another of his books. 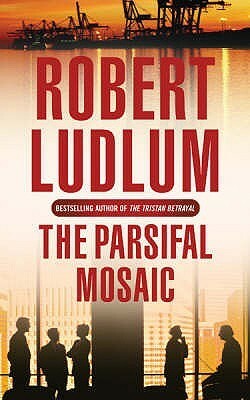 Il mosaico di Parsifal, in originale "The Parsifal Mosaic", è un romanzo di spionaggio scritto nel 1982 da Robert Ludlum. Sembra che Ron Howard è stato contattato dalla Universal per dirigere l'adattamento cinematografico di questo libro. Il mosaico di Parsifal è il romanzo di Ludlum che si concentrata interamente sulla guerra fredda , e sulla possibilità di una guerra nucleare . Altri romanzi come "Il circolo Matarese" e "Aquitania" usano la guerra fredda come sfondo, ma non si basano su di essa come invece accade in questo libro.Robert Ludlum, come già detto molte volte nelle mie precedenti recensioni è un maestro indiscusso del genere spy-story, tanto da meritarsi l'appellativo di "Mr. Plot" -signor complotto-. Ha scritto 27 romanzi thriller. Il numero di copie dei suoi libri in stampa è stimato tra 290 milioni e 500 milioni. I suoi libri sono stati pubblicati in 33 lingue e 40 paesi. Ludlum ha anche pubblicato romanzi sotto gli pseudonimi di Jonathan Ryder e Michael Shepherd. È diventato celebre per la serie di romanzi "The Bourne Identity" ai quali sono stati vagamente ispirati tre film. La trama del romanzo: Micheal Havelock è un ex agente segreto che ha visto il suo amore, Jenna Karas, morire su una spiaggia di Barcellona dopo quello che pensava fosse un tradimento e dopo essersi convinto che faceva il doppio gioco. Lo shock è abbastanza per lui da decidere di lasciare i servizi segreti e andare in pensione. Un giorno però uno sguardo casuale in una affollata stazione ferroviaria di Roma cambia tutto. Si rende conto che lei è, in effetti, non è morta. Quello che segue è una trama davvero contorta, nelle migliori tradizioni "Ludlumiane" che coinvolgerà russi, francesi, corsi e agenti africani fino ad arrivare in fondo dove lo aspetta l'uomo più potente della terra, il presidente degli Stati Uniti. Scoprire una talpa russa ai massimi livelli del Dipartimento di Stato e la possibilità molto reale di una guerra nucleare che coinvolge gli Stati Uniti, la Russia e la Cina... e il misterioso personaggio "Parsifal" che potrebbe far scattare una trappola mortale per l'intera umanità.Ludlum si conferma maestro di articolazione della trama, colpi di scena e dialoghi veloci e ben strutturati. L'intrigo qui è al top. L'autore è una garanzia per questo genere di thriller ambientati nel mondo dei servizi segreti, i suoi libri sono sempre ben documentati e strutturalmente ben progettati, non ci sono falle e l'autore cerca sempre di tenere il lettore sulle spine e ottimizza i colpi di scena in modo da non annoiare mai durante la lettura. Come la maggior parte dei romanzi di Ludlum, il palcoscenico della vicenda è il mondo stesso, per un romanzo che non vedi l'ora di finire. Ludlum, come dico sempre è il maestro di questo genere. Ritmi concitati e una maestria superba nel costruire degli intrecci veramente complicati. Lo consiglio a chi volesse trascorrere qualche ora di tensione e suspance. Anche se, personalmente, se volessi apprezzare da subito l'autore partirei con la Trilogia di Bourne. The Parsifal Mosaic followed the Bourne Identity and is one of his greatest works! Parsifal was originally an Opera by Wagner, Parsifal being a wandering youth in Spain who safeguarded the spear that pierced the side of Christ. It certainly took Robert Ludlum time to develop his craft. His earlier works were absurd, illogical, and disjointed. The Parsifal Mosaic was an international thriller. In both the Parsifal Mosaic and the Bourne Identity Ludlum has developed character depth and logical flow, with some incredible twists! It is very hard to put either of these books down! I read this first when I was in High School...maybe 16 years old. I read almost all of Ludlum's library while I was in High School. My mother liked them, so they were always around. This was one that made a strong impression on me at the time.Some of Ludlum's work has not held up terribly well. It is too deeply rooted in a geopolitical climate that no longer exists. I put The Bourne Identity in that column. This one holds up better. While it does live in the Cold War era of Soviet-US-China relations, it's main theme and plot are still feasible today and are still just as scary.I'd like to re-read The Chancellor Manuscript soon. That one seems like it would hold up well being rooted in an American historical event rather than a globe-spanning conspiracy. Perhaps The Holcroft Covenant too. I'll have to think more about it. As a big time Ludlum fan, I walk into any Ludlum book with high expectations. I think this is a good book, but it was bit of a roller coaster for me in ways that other Ludlum novels weren't. At moments I was confused and a little frustrated, and at others I was captivated. By the end, overall, I was impressed with the scope and the detail of the story.The story is layered and complex, more so than any of his other stories I have read. It felt confusing and convoluted at times in the midst of it, but by the end most of it made sense to me. Much of the plot hinges on the person of Anthony Matthias, and yet since Matthias is essentially a plot device and hardly factors into the actual events of the story, the believability of the plot is somewhat sacrificed in my opinion.Michael and Jenna's relationship is a pleasant dimension to the book, which isn't found in every one of Ludlum's books.I can see how some would think this is one of Ludlum's best novels and how some wouldn't care for it at all. I felt both of those things as I read through it myself. Now, this was my first book of Ludlum that introduced to me all possible intricacies that can exist in the world of espionage. The fact that Ludlum remained king of espionage thrillers was mainly due to the fact of tragic loving reminsces that the protogonist experiences. The emotional struggle of Havelock for the lost love takes second seat when he faces the dilemma – the living conundrum of his mentor Anton Matthias' mental state. International dealings, God knows whether they happen the way Ludlum imagined, but no doubt, later day spooks might have, in all probability, considered his books for reference, if not used as text books.Writing the summary and detailing pros and cons would be doing injustice to such a mystic thriller.This book, in fact forced me to read all other books of Ludlum. Good book. Really a 3.5 for me.Lots of action with twisty-turny plot. I found it difficult to get into, but was into it by page 200 - yes, at 200 you're only just beginning and it continues to page 684, but was an enjoyable read and I found myself wondering what was happening when I wasn't reading it. (For a summary of the book read the publisher's blurb.) Enjoyed the characters, specially the bad guy Arthur Pierce. The whole scenario of Russian agents integrated into American society from birth and brought up to appear as normal, well rounded Americans that are really Russian agents who funnel info and other important documents back to Russia was quite interesting. These agents live two lives and as much of Ludlum's fiction is based on fact this may be true. Must investigate. I started with this when I was in high school, as a sophomore I think. It was very likely during the summer vacation, before I turned 13? The most memorable part that stuck was the arrival of the Apache. That's it. I didn't even understand the context of this story when I was reading it then. I wasn't that mature enough to completely know the why's of their actions and where the hell are they going to. I do remember though the romance part--that's one why I somehow understood, but more in a rational way than emotional.Until now, I don't know the real meaning behind the title--although I have some vague ideas. Michael Havelock, a U.S. spy with a tortured past, finally finds some happiness with a fellow spy, Jenna Karas aka Jenna Karasova. Unfortunately, he discovers that Jenna is a double agent, and watches her die for her betrayal. Preparing to abandon his agent-life and retire to become a teacher, he catches a glimpse of Jenna, alive, at a chance meeting in Europe. The chase is on, as he tries to track down Jenna and figure out why she's alive, and who was deceiving who.Loved the book a lot and enjoyed reading it, especially the first half of the book, which was outstanding. The whole book was long and complicated, filled with many plots. 5/5 for its lengthy complex story. Great read, lots of excitement and suspense. Michael Havelock's world died on a moonlit beach on the Costa Brava. He watched as his partner and lover, Jenna Karas, double agent, was efficiently gunned down by his own agency. There was nothing left for him but to quit the game, Get out. Until, in one frantic moment on a crowded railroad platform in Rome, Havelock saw his Jenna-alive. From then on, he was marked for death by both U.S. and Russian assassins, racing around the globe after his beautifl betrayer, trapped in a massive mosaic of treachery created by a top-level mole with the world in his fist-Parsifal. This is a strange book of two parts. The first part is a sort of serious Mr. and Mrs. Smith (you know the Brad Pitt, Angelina Jollie film the might or might not have contributed to Pitt's divorce). In the second part, it suddenly becomes a question of whether Michael Havelock and Jenna Karas (the Smith's of this book) can save the world from hawkish factions within the KGB, and US State Depatment, who seem intent on starting World War III.It's a silly book, if I'm honest, and perhaps takes itself a little too seriously to be a good book, but it rattles along at a good rate, so it's an easy read if you're looking for something to read over the summer. Too long, more complicated than need be, too wordy, etc. etc. About 1/4 of the way into this story I found myself speed reading, and wishing that I could read faster. Of the 600 pages, at least 200 are not needed. I admit a like/hate relationship to Ludlum's novels, but this one was too drawn out. I'm giving it a three, but just barely.......I look at my books to read and see five more resting there, several thick one's to boot, and almost dread picking the next one up......maybe 6 months or so down the road, or else give them away. Took me 3 attempts to finish this book. Have enjoyed q a few of Ludlum's books. Found this one draggy. Have been told this is one of the great espionage books. Perhaps, the concept of a Soviet in super deep cover, being raised as an American, living, studying and working in the USA was mind-boggling at the time this book was released. Perhaps. Perhaps. Found the pace too slow. Too wordy. Unnecessary details. Found myself looking forward to the end. the book. I refused to quit. I much prefer Frederick Forsyth's ICON. It stirred my interest in espionage books. This is my favorite Ludlum book (to date), probably because the love story made it very personal and less spy-detailed (sorry, folks if that's what you prefer). I do not seek out the "love-story" angle in my books, but I find that this often just adds a more emphatic note for me to connect with the story..as long as the author doesn't run it into the ground with sappy detail; just the human nature of relationships that are so very vital to keeping people like Ludlum's characters real and connected as opposed to the cold, emotionless killers their job isolation often creates. Unlike most other Robert Ludlum novels, this one is somewhat tedious!Its about a Secretary of State is brought under tremendous mental pressure and his mind is cracked by Russians to make him sign treaties with Russia and China the disclosure of which could result in an all out nuclear war which could annihilate Earth!The hero manages to find the original copy of the treaty eventually along with its authors. The pace of the novel is fast but tiresome to read.I think Vince Flynn usually depicts the President of the US much better! Typical early Ludlum storytelling. A complex interwoven plot that is perhaps a bit dated for today. I first read this novel back when it was published in 1982 and, while it is not his best work, it is still one of those stories that, at times, is so exciting that you can't wait to turn the page.Tip: When you start this book, take a deep breath and start running with it. Just don't forget to breathe out!